Being self-employed is a satisfying feeling. Not only do you get to do a job you’re skilled and passionate about, but you get to do it on your own time and without having to worry about paying anyone but yourself. There comes a point, though, when you want a little more. When you know that with a little more exposure, you’ll be able to attract more business and essentially make more money. Expanding and attracting clients can be done in a few ways. But one proven way is to focus on more than just word-of-mouth or referral marketing. Partnering with someone to manage the marketing takes you from self-employed to small business, where you need to cater to more than just yourself, but where revenues are sure to improve if the marketing is done well. So you’ve come to the conclusion that it’s time to take your self employment to the next level. It’s time to hire a marketing specialist to give you increased exposure. And that will hopefully lead to an increase in revenue. Your next question: What type of marketing is best suited to my company’s needs? Since this is a big transition, it’s important that you’re able to measure the worth of your new partner as well as the worth of your marketing efforts. 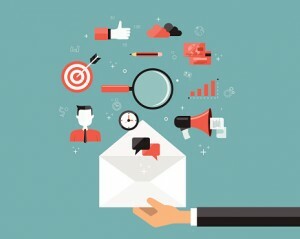 One of the most effective ways of targeting new leads, converting those leads, and then tracking the effectiveness of each campaign is through direct mail marketing. Direct mail is still the most personal form of marketing. And it works. It generates new leads at a rate 10% higher than other mediums, and boasts a conversion rate of 4.4% (which is considered high in the world of marketing). Direct mail is beneficial for those making the leap from self-employed to small business because it’s simple to track the effectiveness of each direct mail campaign. Because mailers are being sent to specific addresses and with specific calls to action (CTAs) for each campaign, you’ll know precisely which targets responded and can make assessments based on the results. E-mail marketing is another great option. And building up a subscriber list is key in sustaining business and introducing new products or services to consumers. The benefit here is that anyone who signs up to your e-mail list has taken a huge leap of trust. They have told you that they believe in your brand and are willing to receive direct communication with relevant information pertaining to that brand. Running e-mail marketing campaigns is relatively inexpensive along with being narrowly targeted to only those who have shown an interest in your business. This is leverage that your new marketing partner can use to their advantage, allowing you to really build on the loyalty of your customers. Social Media marketing goes without saying. Today, it’s difficult to get by without at least some type of online presence and communication to consumers via social media. The positive aspect is that the internet opens you up to a virtually unlimited pool of consumers (depending on your product or service). The one drawback is that measuring the success of a social media campaign can be tricky and isn’t nearly as precise as direct mail marketing or even e-mail marketing. Sometimes being self-employed can put you in a place of comfort. You’re comfortable in your situation even though you know you can be doing more to bring in more business. For those who are courageous enough to take the leap, understanding the importance of marketing can make all the difference between successfully making the transition and wishing you never tried to expand at all. Macromark is built to be that marketing partner you need. With close to 30 years in direct marketing experience, including direct mail and e-mail marketing, Macromark has launched countless successful campaigns for their clients and have helped many small businesses attract the new leads they need to increase revenue. You can trust Macromark to do the same for you. Visit our website and take a look at the history of our company.